WFP/Gregory Barrow In Malawi, a woman picks up her monthly ration of supercereal. The global food chain is a modern marvel. It employs hundreds of millions of people, an eclectic fusion of different cultures from all corners of the world brought together through the wonders of food. It is also a story of industrial-scale hunger and inequality. Oxfam’s new research and its Behind the Price campaign show the hidden human cost to this powerful industry – and it goes to the heart of global poverty. For decades, Oxfam has worked with farmers and workers who grow and process our food. Our research shows that workers employed by and farmers selling into global supply chains are getting a shrinking share of the end consumer price for their produce. Millions of those people behind the everyday items in our shopping baskets don’t earn enough for a decent standard of living. It is a cruel paradox that the people producing our food and their families are often going without enough to eat themselves. How can this be happening? Meet the super-powerful gatekeepers of the global food trade driving inequality: supermarkets. These are well-known, household brands, upon whose convenience and low prices so many of us have come to rely. Their business model has them in brutal competition with each other, using their buying muscle to squeeze their suppliers for the best margins possible. Just 10 supermarkets account for more than half of all food retail sales in the European Union. In the Netherlands, five chains control three quarters. Their share of the final price that consumers pay at the check-out has been rising. If you’re a supermarket shareholder or top executive, then business has been good. The top eight publicly listed supermarkets made $22 billion in profit in 2016 and returned $15 billion of it in cash to shareholders. What chance does a poor woman food producer at the other end of the global trade have in the face of a trillion-dollar buying sector? Meet Budi, a shrimp-processing worker in Indonesia. She has to peel up to 950 shrimps an hour to receive her minimum wage. She avoids going to the toilet and stands for nine hours at a time. It would take her more than 5,000 years to make the average annual salary of a top supermarket CEO in the US. Other women working in shrimp-processing plants told us about having to take mandatory pregnancy testing. They told us about leaving their families for so long that their children forget their faces. They talk about supervisors berating and humiliating them. From poverty wages on Indian tea plantations to hunger among South African grape-pickers, economic exploitation is hardwired into the food system. Every time, the impact is most severe on women. They dominate the least secure and lowest-paid positions, shoulder most of the unpaid work on family farms and are routinely denied a voice in positions of power. The spiralling reach of supermarket giants alongside the erosion of small-scale farmers’ and workers’ bargaining power will continue to increase inequality. Until small-scale farmers and workers get a larger share of the value of the food they produce, tackling poverty will stall. None of this is rocket science. To governments who have liberalized trade and deregulated agricultural and labour markets, this is a consequence of your policies. Governments and supermarkets together have the power to do better. I am yet to hear of any justifiable moral or economic reason why women and men supplying supermarkets should be exploited and go hungry. Supermarkets, too, have a business case to improve. New forms of responsible business are taking hold and new technologies are empowering consumers and investors alike. They must seize this chance to chart a new path. How can they change? As part of our investigation, Oxfam has assessed 16 of the world’s biggest supermarket chains on their policies on transparency and accountability, workers’ rights, women’s rights and small-scale farmers. We have shared our research with them and we hope it starts a race to improve their rankings. There are no high achievers yet. Twelve failed to score a single point on their policies towards women in their supply chains. That sounds negative – it’s a call to action. 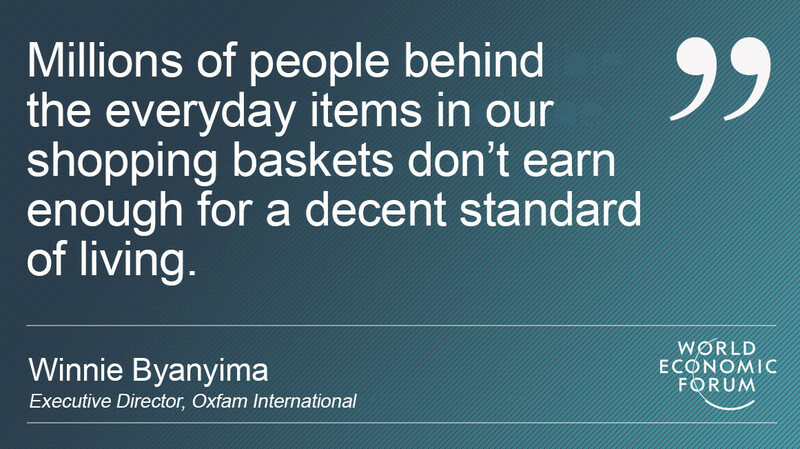 When Oxfam launched a similar initiative called Behind the Brands with the world’s 10 biggest food companies, they made significant improvements. Many of them are proud, and rightly so. Change is achievable. Supermarket CEOs can sign off today on the elimination of unfair trading practices. Take living wages – adding just 0.4% to what we pay in a supermarket would be enough for shrimp-processing workers like Budi in Indonesia to lead a decent life. Better still, that investment could be found simply by distributing current consumer prices more fairly among those in the supply chain. We are also urging governments to intervene – to rein in the abuse of power by supermarkets and their suppliers, and to protect their farmers and workers better. It would be well to invest more in small-scale agriculture, increase the minimum wage to a living wage and guarantee the freedom of workers to organize. These measures would transform millions of lives. A different way of doing business is possible, built on respect for the rights of working women and men, rather than the obsession with squeezing more value for shareholders. Citizens can rally to demand their food be produced without human suffering. Supermarkets must rewrite the business rules of how value is created and shared. The time is ripe for the global food system to end, not uphold, the injustice of poverty.